The 46-foot statue of Mary on a 26-foot base atop Cerro San Cristóbal stands prominently visible from just about everywhere in Santiago. As I stood at the base of the beautiful, white statue, I wondered again about Mary’s life. Was her pregnancy difficult? Did she get morning sickness? Was she treated fairly in her community or shunned? Was she happy with Joseph? Was she stressed out or feel peace about being the mother of Jesus as He encountered the bumps and bruises of life? I wandered into the Sanctuary of the Immaculate Conception on San Cristóbal Hill, an important Catholic site in Chile, and gazed, transfixed, at the murals on the stone walls. The details and colors were beautiful. The scenes started with a holy child with a halo in blue. I saw a toddler climbing steps into the temple. As I looked at each one, I felt more and more confused. Finally, I realized that the child was Mary and not Jesus. Fascinated, I tried to unravel the story in each picture. After some really easy research, I learned the paintings depicted Apocryphal stories of Mary’s life and childhood. I’ve read other apocryphal writings, introduced initially to titles and subjects primarily by reading Hugh Nibley’s works. I felt compelled to find stories about Mary. I found stories specifically about Mary in Islam’s Qu’ran and Baha’i’s Kitáb-i-Íqán which venerate her as the mother of Jesus. Of course, the Book of Mormon also references Mary by name. But, obviously, the most detailed stories of Mary are in the Christian Apocrypha. I found some versions that repulsed me. 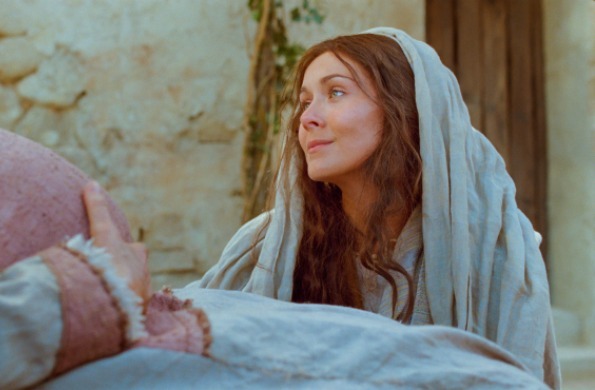 But some were so beautiful, and even if the details were not correct, I felt a better understanding of how Mary could have the capacity, the virtue, the purity to nurture the Son of God without prejudice or limiting beliefs and biases. Mary’s story begins with a story about her parents, Joachim and Anna. They had no children. As an extremely wealthy man, Joachim doubled his sacrifice at the temple as offerings to God and to help the poor. One day when Joachim went to offer sacrifices, the priest mocked his sacrifice. The priest said he couldn’t even offer sacrifices because he obviously wasn’t righteous. God had given children to every righteous person and Joachim had no posterity. He left in despair and went to the desert where he fasted for forty days and forty nights. Anna didn’t know where Joachim had gone so grieved his death and her barrenness. As she prayed in her garden, an angel appeared to her and promised she would conceive. She covenanted to devote the child to the Lord’s service. Two angels appeared to her and told her Joachim was returning from the desert. An angel appeared to Joachim in the desert and told him to return to Anna and she would conceive. He headed home with flocks for sacrifice and met Anna at the city gate waiting for him. When Mary was three years old, they took her to the steps of the temple and she happily entered the temple. She was received by the priest and the grace of God was with her, and everyone loved her. Angels visited her and taught her. Around the time Mary turned 12, the council of priests decided that the children living in the temple should be relocated. The other temple virgins went out of the temple. But, Mary said she could not leave because of her parents’ vow. The high priest did not want to disregard the vow. After much prayer and supplication, the council of priests determined that she should be espoused to a righteous man. They decided that the determination would be based on Isaiah 11. So, all unmarried and fit men were called together. The men gave their rods to the priest. He took them all, prayed over them and gave them back to the men. As he gave Joseph his rod back, a dove came out of the rod and landed on Joseph’s head. Astonished, Joseph protested saying he already had children, and wasn’t prepared to take a young girl to wife. One account, The History of Joseph the Carpenter, says he was 90 at this time. His wife of 49 years died one year before. The priest counseled him to fear God. Joseph settled Mary into his home and said he had to go away to build his buildings, and promised that the Lord would protect her. And he went away. Another account said she returned to her parents’ home after he left. While he was gone, Mary was asked to help make the veil of the temple. Angel Gabriel appeared to her during this effort and declared she’d be the mother of Christ. When she took her finished purple and scarlet to the temple, the priest reiterated the blessings Gabriel promised her. Apocryphal translations say she was 14, 15, 16, and 17 when she conceived. Most versions indicate that she’d lived in Joseph’s home at least two years before the Annunciation. She stayed with Elizabeth for 3 months and then hid herself in the house, Joseph’s or her parents’, as her pregnancy progressed. When Mary was six months along, Joseph returned home and discovered her pregnancy. Astonished, he asked her how she could have violated the virtue gained from living in the temple. She declared that she was innocent of sexual misconduct. Joseph agonized over what to do. The angel appeared, as in the Biblical account, and told him everything would be OK. The next morning, Annas the scribe, visited the home to find out why Joseph missed a meeting at the temple. He happened to see Mary and ran to tell the priest. They were brought before the priest and interrogated. Joseph and Mary declared their innocence. The priest orders them to drink the water of the ordeal of the Lord. If they lived, they were innocent. If they died, they were guilty. They both drank and were sent away to the hill-country. To everyone’s astonishment, they both returned unhurt. The priest basically said that if God didn’t judge them, he wouldn’t either. They went back to Joseph’s home rejoicing. The apocryphal journey to Bethlehem added Joseph’s sons accompanying the journey, since they needed to enroll, too. Near Bethlehem, Mary asked to stop. Her labor commenced. Joseph found a cave and left her in the care of his sons as he ran to look for help. He met a midwife hurrying towards him on the road. She’d been divinely sent to find them and assist in the Savior’s birth. The Apocrypha says that Joseph died at 111. Mary would have been 33. Jesus would have been 16-19. After Jesus’ death, Mary is recorded in the upper room with the apostles. Not much is told of her until her death (that I could find). Most Apocryphal accounts record her death in Jerusalem. Some later Christian writings said she died in Ephesus where John lived at the time. Most say she died two years after the Savior’s death. One writer said she died 11 years later. Her final story began as she knew she was dying. She prayed for strength. She suddenly began to be miraculously surrounded by the Apostles who were whisked away by the Spirit from their various locations and brought to her bedside. John from Ephesus. Peter from Rome. Paul from Tiberis. Thomas from India. James from Jerusalem. The Apostles who had been killed also appeared. They comforted her and laid her body in a new tomb. After three days her body was gone, and it was said, that she ascended into heaven. I am so grateful for Mary, for her righteous, virtuous life. I’m grateful she withstood the trials she faced in mothering Jesus Christ. I’m grateful for her love and sacrifice. As I read these stories, the most striking image for me was of Mary standing before the high priest declaring her chastity. She never wavered or shrank. I felt her courage and resolve to stand in truth. She stood with power. She told the high priest, (who was, in a few spots named Caiaphas! ), to ask God to reveal the truth of her situation to him. And that is the ultimate opportunity for all of us, isn’t it, to ask God to reveal truth to us? I know He does and will.